We offer two convenient and effective methods of teeth whitening. Which one is better for your busy schedule? From social and dating situations to career advancement, our smiles affect every aspect of our lives. If you’ve wished that your smile was a little bit brighter, our Zoom! or take-home whitening treatments may be perfect for you. Each can whiten your teeth by multiple shades in a short amount of time and both are popular, safe, and effective. Consider trying a teeth whitening treatment with Dr. Rudner and everyone will notice the difference in your smile. If you would like a whiter, brighter smile quickly and easily, no treatment provides results superior to those of the Zoom!® in-office teeth whitening system. 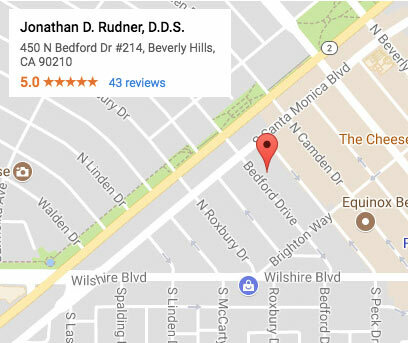 Simply schedule an appointment at our Beverly Hills and Santa Monica area office, where we can brighten your teeth an average of eight shades safely and effectively in less than an hour. The Zoom!® system uses a unique hydrogen peroxide-based gel, which is applied to the teeth and then activated with the special Zoom!® light to create a powerful tooth-bleaching reaction. This process releases oxygen to lighten discolorations without harming tooth structure, removing even years-old stains. Best of all, the results of the Zoom!® teeth whitening system are immediately noticeable, so you’ll leave after your appointment with a dramatically different smile that you’ll be anxious to show off! While Zoom!® professional chairside whitening produces outstanding results, we also offer take-home teeth whitening products designed to produce superlative results faster and more effectively than the typical over-the-counter teeth whitening products you might find in your local drugstore. Many patients also use our take-home teeth whitening solutions to touch up and maintain their smiles after Zoom!® chairside treatment. Day White® is applied twice a day using comfortable custom-fitted trays for only 30 minutes at a time, achieving striking results quickly and effectively. Using a patented two-chamber syringe design which allows you to control the precise amount of whitening gel while ensuring maximum whitening potency, Day White® allows you to brighten your smile in just days, right in the comfort of your own home.